What better way to kick off the New Year then with a live performance and conversation with an old friend in WSHU’s Studio A. 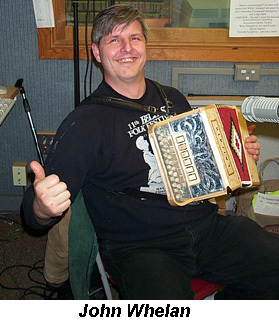 We welcomed back to Profiles In Folk seven-time All-Ireland button accordion champion John Whelan, a high-energy musician who resides in nearby Milford, where he also headquarters his production company, Jar Productions. John was appearing within our broadcast area that weekend, but he’s always welcome at Profiles in Folk. The conversation was free flowing (as it always is with John) and ranged from his early days in America and recording with Eileen Ivers to last summer’s reunion concert at the Milwaukee Celtic Festival with his old band mates in Kips Bay Ceili Band to medical problems he encountered and overcame last year to last May’s concert in Connecticut in which he teamed up with renowned fiddler Kevin Burke and guitarist John Brennan. In addition to John’s live performances, we played cuts from a very limited edition Kips Bay CD called “Looking Back/Live In Denmark”, which John thought might be the first time it was aired on the radio, and from CDs of a group that just recorded one of John’s tunes and a new solo release from Eric Merrill, the fiddler in the John Whelan Band.